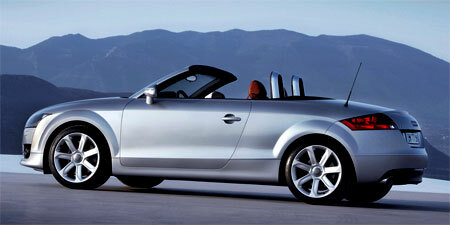 Along with the recently launched TT Coupe comes it’s open top brother – the 2007 Audi TT Roadster! Using the same advanced Audi Space Frame (ASF) comprising of 58 percent aluminium and 42 percent steel to minimize weight, the new TT Roadster is 100 percent more rigid than it’s predecessor, and there are a choice of two engines to propel it’s 1,295kg of weight forward. 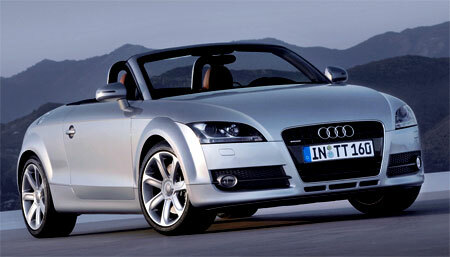 Despite most manufacturers steering towards hard top convertibles, the Audi TT Roadster retains a cloth top built around a steel and aluminium support framework, which opens and closes in 12 seconds using a Z-fold system and can be operated at speeds up to 50km/h. 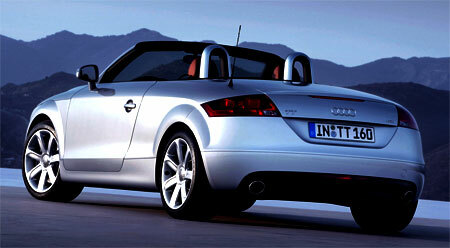 The soft top hood also incorporates a heated glass rear window. Engine options are the same as it’s hard top brother – a 2.0 litre Turbo FSI engine making 200PS put down through the front wheels, or a 3.2 litre V6 normally aspirated engine putting out 250PS with Quattro all wheel drive. Both variants come stock with a 6-speed manual transmission, but can be upgraded to a 6-speed S-Tronic gearbox, which is what Audi calls it’s DSG transmission.